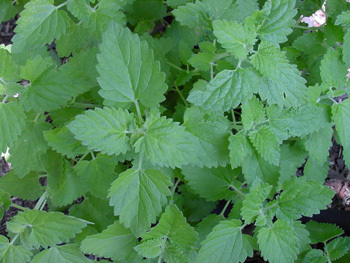 Catnip is a perennial herb of the mint family. Its erect, square, branching stem is hairy and grows from 3-5 feet high. The oblong or cordate, pointed leaves have scalloped edges and gray or whitish hairs on the lower side. The bilabiate flowers are white with purple spots and grow in spikes; these are small and hooded, and grow in crowded whorls from June to September. The plant has a pleasant, aromatic odor. Found in disturbed habitats throughout much of North America. Native to Europe. Common inhabitant of hedges and waste places. Acetic acid, biotin, buteric acid, choline, citral, dipentene, inositol, lifronella, limonene, manganese, nepetalic acid, volatile oils, PABA, phosphorus, sodium, sulfur, valeric acid, and vitamins A, B1, B2, B3, B5, B6, B9, and B12. Good-tasting aromatic tea. Old country favorite in England even before oriental tea was introduced there. High in vitamin C. Stimulates the appetite if served cold before meals; aids digestion if served hot after meals. Hot tea also makes a soothing nightcap. Catnip has been used since Biblical times as a tea; it has a calming effect on humans. It’s extremely exciting and attractive to cats, who are apt to romp in and tear up the plants, which does not effect their health. From an English herbalist comes the sobering advice that the root of catnip “when chewed is said to make the most gentle person fierce and quarrelsome, and there is a legend of a certain hangman who could never screw up his courage to the point of hanging anybody till he had partaken of it”. In Colonial times, catnip tea was much used as a substitute for hard-to-get chamomile flowers. Catnip grew like weeds wherever the pioneers lived. Like chamomile, the warm tea was used for infants and children to soothe their stomach (simple colic) and help them sleep. Catnip tea is still very popular among folks living in isolated communities in the Cumberland Mountains, Kentucky and the Ozarks. Rats are said to be repelled by catnip; so it might be a suitable protective plant around grain crops. In fact, The Herbalist Almanac tells of catnip growing around buildings of old farms because of an old belief that the odor of this plant drove off rats. The plants were set as a barricade around the buildings. One beekeeper is sold on catnip; claims catnip yields considerable honey. If there is any plant that should be cultivated specially for honey it should be catnip he declares. Catnip is one of the oldest household remedies. Controls fever (catnip enemas reduce fever quickly). Good for colic, colds, flu, inflammation, pain, chickenpox, leaves chewed to relieve toothache, and convulsions. Stimulates the appetite. Aids digestion and sleep. Relieves stress, promotes sweating, relieves painful menstruation, used to promote menstruation. Popular uses in Europe are for chronic bronchitis and for diarrhea. A tbsp. steeped in a pint of water and used as an enema is soothing and quieting, especially in children, and very effective in convulsions, and for expelling worms in children. Leaves bruised and applied to hemorrhoids eases the pain. Infusion: use 1 tsp. herb with 1 cup boiling water. Steep only; do not allow to boil. Take 1-2 cups a day. Tincture: take 1/2 to 1 tsp. at a time. Vitamin A, B1, B2, B3, B5, B6, B9, and B12 and C.
Capsules: take 1 to 3 daily. Extract: mix 1/2 to 1 tsp. in 1/2 cup warm water and drink as a tea. Secrets of the Chinese Herbalists , by Richard Lucas, Parker Publishing Company, Inc., West Nyack, NY, 1987.